All teams completing the Clipper 2015-16 Race will proudly take to the stage at the London Race Finish this Saturday, aware they have achieved a feat that very few people have or will experience in their lifetimes. However, only one team will get to raise the Clipper Race trophy, which has been contested fiercely for over 14 gruelling races and nearly a year of competition. Since The Times 2000 Clipper Race trophy was awarded for the first time to the winning yacht, Bristol, led by Bob Beggs, Skippers and crew alike have strived tirelessly over miles of the world’s oceans in their aim to claim the ultimate honour and satisfaction - raising the winner’s trophy. In celebration of the 20th anniversary of the first Clipper Race, with almost 4 million nautical miles raced around the globe, the trophy has been revamped and has a brand new look. After commissioning Links of London to design and produce the trophy, it will be on show at St Katharine Docks prior to the Clipper 2015-16 Race Finish, where it will be awarded for the first time. The new trophy showcases a silver globe, incorporating pure gold design elements which capture the motion and excitement of the race. It is supported by three silver sails on a base of West African mahogany; a material which has played a part in boat building history. 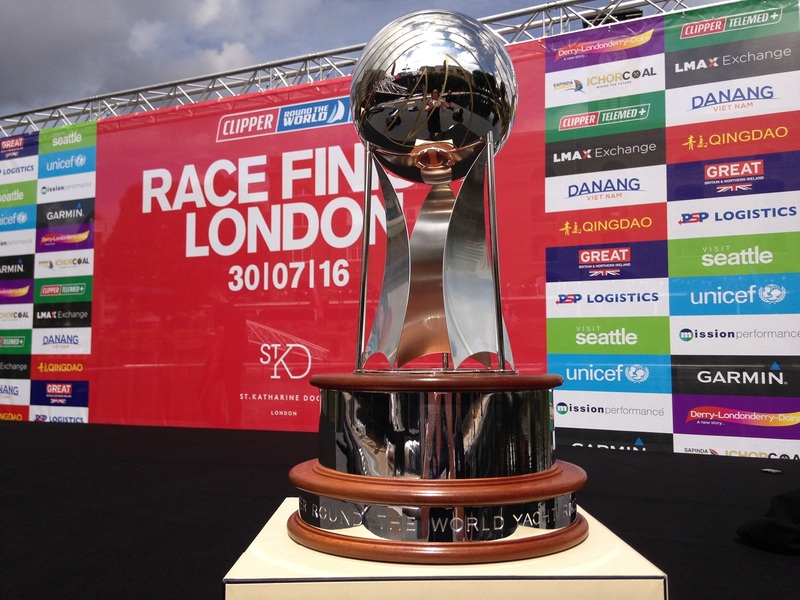 Who will be first to raise the new Clipper Race trophy? Current race leader LMAX Exchange is six points clear of second place Derry~Londonderry~Doire but with one race remaining and a maximum twelve points still up for the taking, the final result is unknown. The Clipper 2015-16 Prize Giving gets underway from 12:55 UTC on Saturday 30 July. Follow live video of the ceremony via the Periscope app or Twitter by following @ClipperRace.